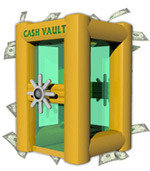 One technique that is being utilized by financial establishments, academic institution, and private companies is money machines. 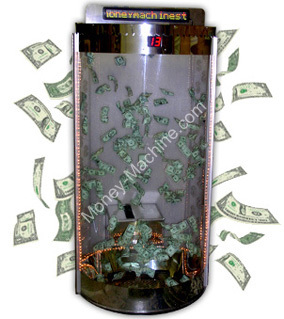 A money blowing machine offers individuals a chance to gain money and or prize vouchers in a sealed environment that allows onlookers to watch the action and become acquainted with the sponsor. Why do people stop and stare at an accident on the freeway or minor collisions on city streets? Human curiosity is the answer. Curiosity is one of the greatest marketing tools an organization can harness if they want to gain the attention of a large number of people. If the organization can capture the interest of a few individuals, others will stop to look just because someone else is interested. 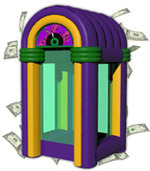 This is where using a cash cube appears to have a great advantage over other marketing tools. People are attracted to the idea of a challenge and gaining extra money and where a few individuals are attracted, other people will try to find out what is happening and learn how they can become involved. The promoter has gained an audience and the exchange of information has begun. 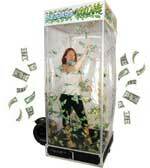 Of the many organizations that have utilized the curiosity factor of a money blowing cube, Eastern Michigan University brought an additional flare to their Employee Wellness Fair by including a money machine in with their free massages and blood pressure booths. They set it up to illustrate money management by teaching participants to take hold of their money and to not let go of it. 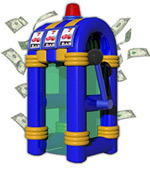 Wachovia has orchestrated other events that highlight a money blowing cube as a teaching mechanism as well. 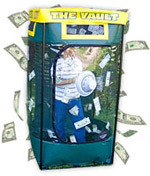 This financial institution uses the money booth in a variety of ways to promote savings awareness, such as the Way2Save Challenge, as well as their sponsorship of charitable organizations. 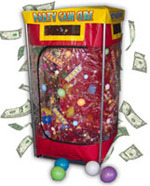 A money machine is not only a great educational device; it also has marketable entertainment value. The Clearwater Casino in Washington State includes a year round cash cube because it is not only fun for the participant but is also enjoyable for the individuals on the outside to watch the participants gathering money on the inside. 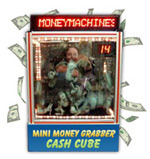 Another venue that hosts a money blowing cube on an annual basis is the New York State Fair. 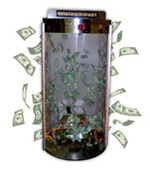 Channel 9 News sponsors the money booth that allows individuals 30 seconds of time to catch as much money as they are able to. Capturing the attention of an audience is difficult in this age of information overload. Being creative in getting your message to the target audience is not as easy as it once was. 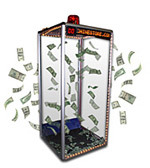 Many organizations, ranging from collegiate institutions, financial establishments, and private corporations have begun using money booths to raise awareness for savings accounts, charitable organizations, and for just having fun because of the human curiosity factor. Providing a challenge and the potential of extra cash are two of the best tools a marketing team can utilize in gaining their audience's interest.